I love learning new techniques especially using Adobe Photoshop. 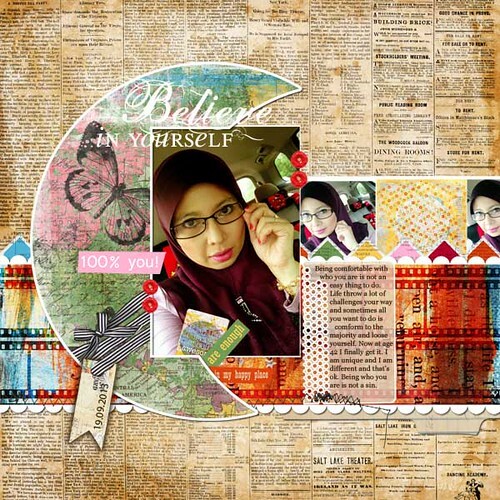 "Digi: In Deep is the third in Jessica's series of online digital scrapbooking courses. If you have quite a bit of digital scrapbook experience, and you know your Adobe Photoshop or Photoshop Element than this class is for you! speed up basic tasks with hotkeys and shortcuts for drawing, masking, cropping, color enhancement, and more!
" excerpt from product description. Jessica is a great teacher. She split one lesson into multiple session, you can follow along easily and didn't get overwhelmed. The great thing about this course is it is a self pace style and it is available to you as long as there's internet. Lesson 1 is all about making unusual shapes, Create straight scalloped edges on patterned paper, wrap ribbon around objects, Hang a tag from ribbon and create compound masks for a single sheet of patterned paper. I have never really play with unusual or complex shapes before but this lesson really open my eyes and make me see things differently especially when making a layout. Here are a few layouts I made using the technique I learn from the class. I still have a long way to go to prefect this technique but I am still happy that now I have the skill to do them. Now I am ready to continue with lesson 2. So exciting!